Making the transition from the crib to a bed can sometimes be a difficult process. But it doesn't have to be! Knowing when to make this switch is easy...if your son or daughter is able to get out of the crib, that's a good sign that it's time to make the move! 1) Let your child be involved in making the decision. Some children can't wait to get out of their cribs, while others feel a sense of comfort and will resist the change. Either way don't force the issue. 3)It is a good idea to put bumpers on the new bed so your child doesn't roll out of bed. Toddler beds are often low to the ground so this lessens the risk of severe injury. 4) Make sure the bedroom furniture is secure, put locks on dresser drawers, keep mini-blind, drapes, and curtain cords well out of reach, remove small toys or objects that could be a potential choking hazard. 5) You want to make sure your child's bedroom is a place where he or she feels safe. Nightlights or dim lamps that can be put on a timer are a great investment for children who are scared of the dark. 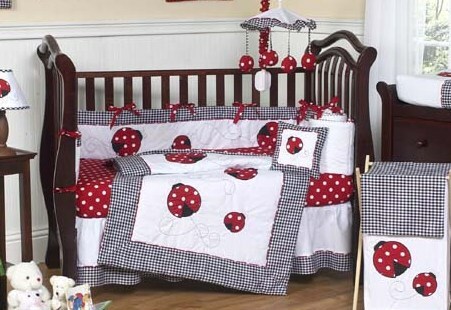 6) Finally, choose a toddler bedding set with a theme he or she is interested in. 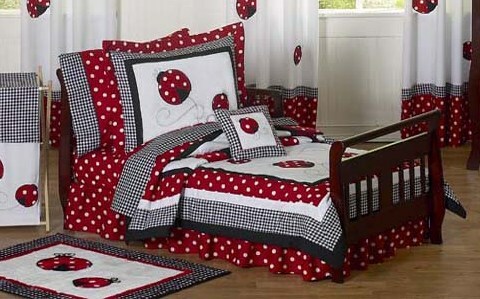 For example if your little boy loves airplanes, go with an airplane themed bedding set.